It happens nine times per home game, Class A Bowling Green manager Craig Albernaz reckons. Just as a Hot Rods pitcher finishes his warmup tosses before each inning, Ronaldo Hernandez pops up and fires to second base, preparing his own arm to throw out any attempted basestealers and simultaneously warning them. After seeing Hernandez uncork one right on the money, opposing managers -- on the way to coach third base right in front of the Bowling Green dugout -- turn to Albernaz and give a knowing nod, maybe even a laugh or an audible, "Wow." They're acknowledging what the Rays organization has known for a while and what many around the Minors have come to learn in 2018: Hernandez has the tools to be one of the game's most promising catching prospects. "He's not holding anything back with those throws," his skipper said. "Everybody knows what he is and what he can be right when they see him." That arm, which grades out as plus and could even be considered plus-plus, has helped Hernandez throw out 48.6 percent of attempted basestealers during his four-year Minor League career. But even that tool, as good as it is, is only part of what's given Hernandez so much helium in his first campaign with a full-season club. The Rays' No. 6 prospect leads the Midwest League with 18 homers in 90 games. He also places second with a .515 slugging percentage, third with an .858 OPS and eighth with a 138 wRC+. (Royce Lewis -- the No. 1 overall pick in the 2017 Draft -- produced a 140 wRC+ for Cedar Rapids before he moved up to Class A Advanced Fort Myers last month.) He's batting .290 with a .343 on-base percentage, each tops among catchers on the circuit. He was a Midwest League All-Star and he won the league's Home Run Derby. If Hernandez was just a promising hitter, he would be a decent prospect. If he was just a catcher with a good arm, there would be something to dream on. The fact that he's combining these skills in one package speaks highly for his future, especially for a player who was initially an infielder and signed for just $225,000 out of his native Colombia in August 2014. "Aw man, it's hard not to be impressed overall by how he's grown this year," Albernaz said. "Seeing him in Spring Training really for the first time, I could see the tools right away -- the big arm, the plus power. And then you see him every day and see how he's grown. It's really exciting. The numbers he's put up offensively from a premium position, the way he's taken the reins from behind the plate, none of those things get overlooked." The power has been the newest and perhaps most notable development. At 6-foot-1, 185 pounds, the right-handed batter has always had the potential for pop but had seen it manifest in different ways over his first three seasons in Rookie-level leagues. In 2017 with Princeton, he hit .332/.382/.507, but most of that power came in the gaps, with Hernandez hitting only five homers compared to 22 doubles and a triple over 54 games. Only sixth-ranked Blue Jays prospect Kevin Smith had more two-baggers in the Appalachian League last season. The transition from gap hitter to over-the-wall slugger partly has to do with an improvement in Hernandez's ability to get the ball in the air. Of the balls Hernandez has put in play this season, 40.4 percent have been fly balls, up from 31.3 percent last season at Princeton. Conversely, he's done a better job at keeping the ball off the dirt and grass with a 37.8 percent ground-ball rate, which is a drop from his 45.1 percent rate in 2017. In essence, Hernandez went from hitting a plurality of his balls onto the ground to putting them in the air. Combined with added strength that has come as part of Hernandez's maturation process, that's led to a significant jump in home run production. 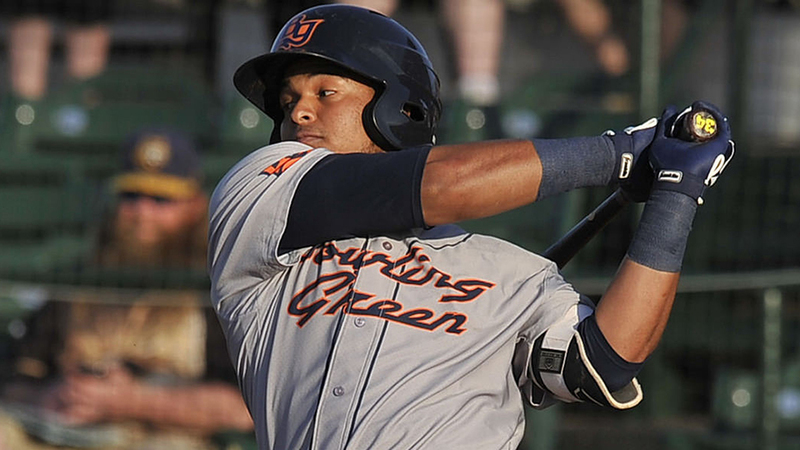 While Albernaz admits there are some drills his club works on to drive home a certain approach, he says it's been more natural ability that's helped Hernandez generate some of the best power the Midwest League has seen this season. "He's got strong, quick hands, and the speed off the bat is one of the best we have here, so it definitely impacts the ball really well," the Hot Rods manager said. "But it's like a golf swing; you have to put everything else together, and then you can start talking about loft. We put screens out there by the mound to give guys a visual of how best to hit it but, really, it's about driving the ball. I haven't even talked with him about if it's a useful drill yet. The only thing I want him to do is hit the crap out of the ball." As good as Hernandez's numbers look overall, there has been a minor issue with consistency, though that is to be expected from a player who had never played more than 54 games in a Minor League season until now. The backstop's big breakout month came in June, when he hit .366/.398/.829 with 10 homers over 22 games. Class A Advanced Daytona's Ibandel Isabel (11 homers) was the only Minor Leaguer to go deep more than Hernandez did in June. That was, unfortunately, followed by a rough July in which Hernandez hit just .241/.302/.367 in 21 games, causing his season OPS to drop from .919 to .856. He's since bounced back, including producing a two-homer game last Thursday at Lake County. That's all part of what the Rays figured Hernandez would experience in his first taste of full-season ball. "I told him I think the July he had is going to be more useful for him than June was," Albernaz said. "He had to deal with failure, being tired, just the fact of catching every day for this long. This Kentucky weather, it's not forgiving either. The travel may be the worst in the league down here, too, with it taking seven hours on a bus to get to anywhere. But no matter what, he's always putting in the work. We're always coaching quality over quantity with him, and he's really buying in. It's going to be fun to see him finish strong." As far as defense goes, Albernaz -- a catcher himself during his nine seasons playing in the Minors -- and the rest of the Rays organization are looking only for Hernandez to be consistent through the rigors of August and an upcoming Midwest League playoff run. That process began back in late May, when Zacrey Law -- with whom Hernandez had been sharing catching duties -- was moved up to Class A Advanced Charlotte. Albernaz had to tell the 20-year-old that he'd need to shoulder more of the load following the transaction, and that would be a big test of his potential. His 33.9 percent caught-stealing rate this season is down from his career average as he's had his arm tested against smarter, more strategic runners (who have been forewarned by this between-innings tosses), but there are plenty of reasons to be high on Hernandez's potential behind the plate. "I said, 'This is your team now. Everyone knows you can hit, that you're going to be a hitter. This is how you need to prove you can be a Major League catcher.' And he really took that to heart." Hernandez has taken the opportunity and run with it -- it's no coincidence that his big month of June came right after Law's promotion -- placing himself squarely on the national radar as one of the best catching prospects in the game. Albernaz said Hernandez's teammates were frustrated when the backstop wasn't honored with a place in this year's Futures Game, where he could have put all of his tools on display in front of a wider audience than, say, Lansing or Fort Wayne. The way things are progressing in Hernandez's career, it may not be long before everyone across baseball knows all about him. "I feel like he's exceeded our expectations," Albernaz said. "It's not like we had a set number in mind, but we didn't expect these types of offensive numbers in his first long season right away. Everyone is impressed. With kids like this that do all the hard work, you hope it doesn't go unnoticed, and it hasn't. Even when we had him and [Law], all the eyes were on Ronaldo. The Rays organization, everyone here, is happy and proud of where he is as a player."